Boasting the citrusy taste of ripe, flavorful oranges, this orange juice contains 100% daily vitamin C value per serving! Compared to other types of packaging, this canned juice provides convenient storing and stacking to keep your business in good supply, and it doesn't require refrigeration until after it is opened. When ready for use, simply chill, shake well, and pour! Easy to use, versatile, and fresh-tasting, this orange juice features an appealing light to medium orange color and clean, smooth taste. From breakfast beverages to evening cocktails, orange juice is an essential ingredient to have on hand throughout the day. It's sure to freshen up your patrons at your hotel or resort's breakfast bar or buffet. Mix it with other fruit flavors to create an irresistible, cool fruit punch for your next party or event! Use this orange juice at your bar service to create classic mimosas and sangrias, as well as a variety of other fruity, tropical-tasting drinks like Bahama Mamas, Tequila Sunrise, and orange bellinis. Try adding orange juice into marinades or glazes for a splash of citrus flavor. 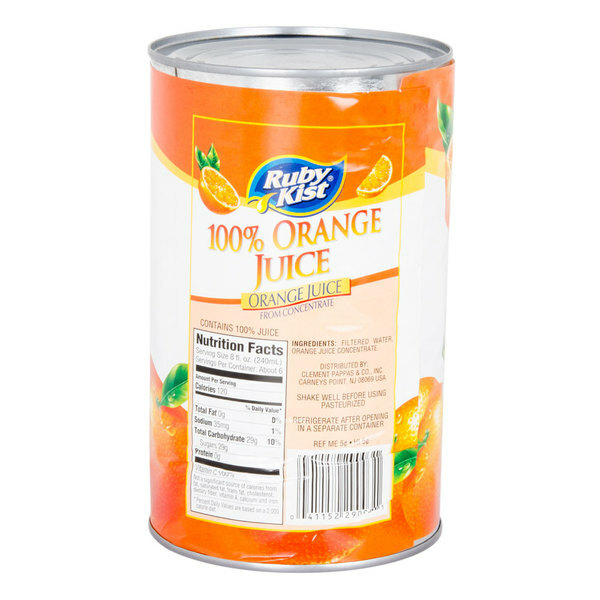 Whichever way it is served, this conveniently canned orange juice is sure to satisfy! I've been pleasantly surprised how good the Ruby Kist products are. The price is so good I had to give it a try and I'm glad I did. This is a great tasting orange juice! My kids love oj so I love buying these cans in bulk. They are great quality and make for a great breakfast treat. The taste is fresh and the leftovers store great in the refrigerator. The Canned orange juice is great for making our mandarin orange chicken. The juice is a good quality and great price. The large cans are perfect for our large batches. I make punch for our kids every Saturday morning for breakfast. The large canned of orange juice is the perfect size for our family. The juice tastes really good and love that I can store it in the pantry. We use the canned orange juice as a mixer and a marinade base in our restaurant. it is a great tasting canned orange juice, but we still prefer refrigerated fresh squeezed juice when serving as a plain beverage. 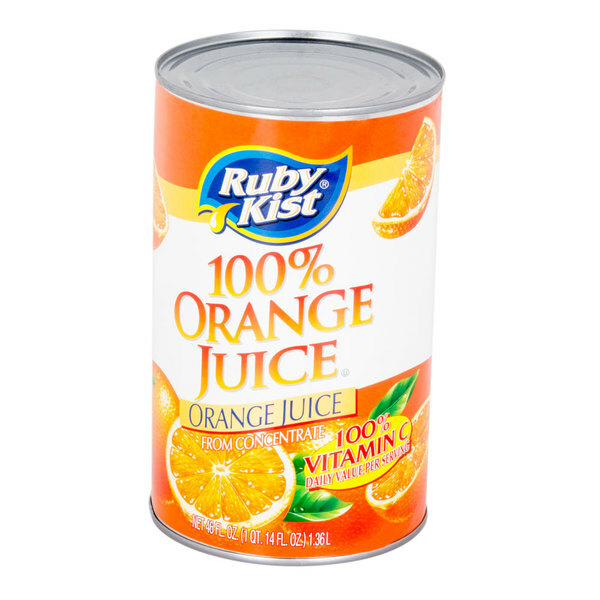 The canned orange juice is a great value and is perfect for any bar drink. This orange juice was not that great. It kind of reminded me of artificial orange drinks I drank as a kid. If you like artificial tasting orange drinks, then this orange juice is for you. I tried this orange juice and wasn't too impressed. It isn't very sweet and just isn't hearty like I look for in an orange juice. This would be ok for mixers though. Great tasting OJ at it's best! If you love the taste of fresh squeezed OJ, this is the product for you. IIf you don't plan on using the whole container, it doesn't reseal. The absolute only negative for this product is that obviously the can doesnt reseal. You will need to pour this into another container but the taste is delicious! This is a really convenient thing to have around. it'll last for a while in the can, then you just need to put it in something else and refrigerate it. good oj. I mixed this to make mimosa's for a bridal shower and it tasted great. This stuff is better than some of the other name brands. I only needed one can and it made a large pitcher of mimosa's. I would recommend purchasing because you won't be disappointed. This OJ does not need to be thinned out with additional water. It is not from concentrate so you can drink it straight from the can. These tasted artificial. Furthermore a majority of our customers did not like the taste of this canned orange juice. I don't recommend these for those looking for those looking for an authentic taste. Tastes super fresh. Perfect for our bar with limited refrigerator space. Customers love the taste and makes perfect cocktails and sauces. Highly recommend this product. I do recommend this Canned Orange Juice, because there is no need for refrigeration, the price that you paying is worth it, you will save money in light, in comparative with the ones that you need refrigeration. This product did not taste the way you might expect canned orange juice to taste--like the can. This was so flavorful that you could add water to it and make more than 46 ounces, if you wanted. You'd need to taste, to make sure you didn't weaken the flavor too much. This orange juice is awesome!! Not only does it have a long shelf life but the flavor isn't what you would expect from a can it's great! This is a really great and fresh tasting product for an equally great price. The canned juice lasts much longer and is great for marinades. Good flavor, does not taste like it comes from the can. It has a good shelf life and is great chilled and straight out of the can. Great canned juice product! Good price! Excellent long lasting shelf life! Great to stock up on because refrigeration is not needed until the product is opened! Overall Great!! !